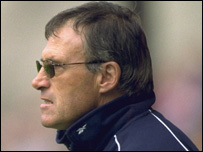 Former Crewe Alexandra manager Dario Gradi has said the money footballers earn is "embarrassing". Gradi told BBC Radio Stoke: "I could talk for two or three days about how footballers are getting greedier. "When you think of people that live in poverty then it is embarrassing but that's not to say that there aren't good people in the game." Gradi managed the Alex for 24 years from 1983 to 2007 and is now the club's technical director. Gradi's move upstairs meant Steve Holland took charge of first-team duties. "It was decided two years ago that was how things would work out," added Gradi. "At the time I thought maybe it was a bit earlier than I would have liked but it came at the right time for Steve." In his time with the Railwaymen Gradi oversaw the development and subsequent sales of stars such as David Platt, Neil Lennon, Rob Jones and Dean Ashton. But he now fears some players are too keen to move away from small clubs. "Billy Jones [who moved from Crewe to Preston in June 2007] is a good example of how things are going. We've got to improve the team, I don't think the players we had last season are going to be a lot better than they were. "Billy chose to leave earlier than he should have and with no regard to the club he left behind. "It will now be interesting to see if he still makes it to the top, which is where he should have gone. "He should play for England so now we will wait and see if he gets anywhere near that." The 66-year-old is now playing a major role in bringing players to South Cheshire to improve a squad that only avoided relegation from League One on the final day of last term. "We've got to improve the team, I don't think the players we had last season are going to be a lot better than they were. Crewe are currently waiting for a work permit for Congolese striker Calvin Zola while Southend goalkeeper Steve Collis is mulling over a move to Gresty Road.